The HTC Radiant has gone official, except it's now called the Titan II, and it does in fact come packing Mango and LTE. Around back is a 16-megapixel camera capable of capturing 720p video and a 1.3-megapixel shooter up front for video chats. We can tell that it's packing the dual-flashes from the leak but, we're not sure about not much else -- including processor, pricing or availability. So, there it is folks -- LTE on a Windows phone, and it's appears to be quite a beast of a device. Update: Official PR has finally hit the wires and we now know it's packing a 1.5GHz Snapdragon (single-core, of course) and a 1,730mAh battery pack. The latter necessary to keep that huge 4.7-inch display and power-sucking 4G radio humming as long as possible. One more photo after the break. 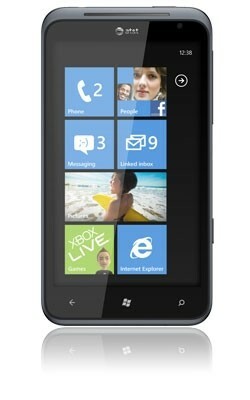 HTC's LTE Portfolio Expands With Fourth LTE Smartphone; Latest Windows Phone from HTC to Run on AT&T's 4G LTE Network in U.S.
LAS VEGAS - Jan. 9, 2012 -At the 2012 International CES, HTC Corp. today introduced the HTC TITAN™ II as the company's first Windows Phone to run on a 4G LTE network. Available in the coming months to AT&T customers, the smartphone includes the largest display among Windows Phones, an advanced 16-megapixel digital camera and access to 4G LTE* speeds. "HTC's history of innovation in 4G technology includes delivering the first 4G-powered devices to each major carrier in the U.S., so it is exciting today to continue that leadership with our first 4G LTE Windows Phone, the HTC TITAN II," said Peter Chou, CEO of HTC Corp. "This full-featured smartphone combines HTC's design with AT&T's high-speed 4G LTE network and Microsoft's powerful Windows Phone software, giving people more of what they crave." The HTC TITAN II comes equipped with a brilliant 4.7-inch super LCD capacitive touchscreen display for an optimized viewing experience when watching movies, playing games or enjoying photos and videos. The HTC TITAN II offers quick and easy access to the latest movies and TV shows via HTC Watch and on-the-go gaming with Xbox LIVE. Packed with advanced imaging technology, the HTC TITAN II features a 16-megapixel camera with a wide-angle lens, autofocus, dual LED flash, red eye reduction, image stabilization, a backside-illuminated sensor and a physical camera button, offering a viable replacement for digital point-and-shoot cameras. The HTC TITAN II delivers a number of features that HTC has developed to help consumers capture photos in a variety of conditions; for instance, panoramic shot for sweeping landscapes and burst shot for action photography. The smartphone also enables 720p HD video recording with the rear-facing camera, as well as on-the-go video chat over Wi-Fi with its 1.3-megapixel front-facing camera. Access to AT&T's speedy 4G LTE network paired with Qualcomm's 1.5 GHz Snapdragon™ S2 processor, enables the HTC TITAN II to deliver fast Web surfing, streaming and downloading. This new powerful smartphone will also feature a 1,730mAh lithium ion battery to support the robust mobile experience on one of the fastest 4G LTE networks. Featuring the latest version of Windows Phone, the HTC TITAN II enhances connectivity, efficiency and productivity for busy consumers with its large on-screen keyboard and instant access to Windows Phone Office Hub, Microsoft Exchange 2010 and Outlook Mobile. The Live Tile display brings friend and family groups to life and delivers the latest updates and news from popular social networks directly to the home screen. HTC TITAN II customers will also be able to download a number of exclusive HTC applications for free within Windows Marketplace through HTC Hub. The HTC TITAN II is expected to become available exclusively from AT&T in the U.S. in the coming months. *Limited 4G LTE availability in select markets. 4G speeds delivered by LTE, or HSPA+ with enhanced backhaul, where available. Deployment ongoing. Compatible data plan required. LTE is a trademark of ETSI. Learn more at att.com/network. Founded in 1997, HTC Corp. (HTC) is the creator of many award-winning mobile devices and industry firsts. By putting people at the center of everything it does, HTC pushes the boundaries of design and technology to create innovative and personal experiences for consumers around the globe. HTC's portfolio includes smartphones and tablets powered by HTC Sense™, a multilayered graphical user interface that vastly improves user experience. HTC is listed on the Taiwan Stock Exchange (TWSE: 2498). For more information, please visit www.htc.com. Media Molecule’s latest shows plenty of promise. The 1Voice AXR Bluetooth Headphones offer comfort and convenience without sacrificing sound quality.